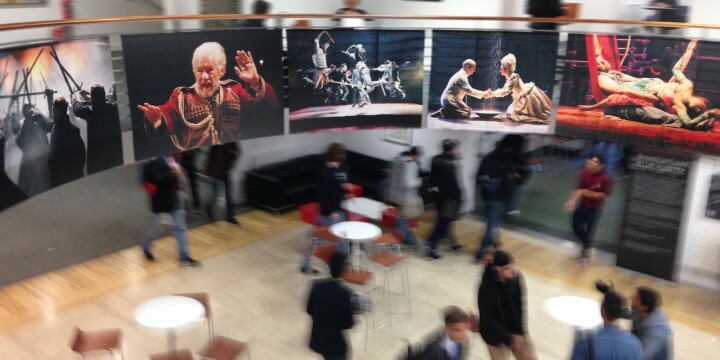 Celebrating the launch of Global Shakespeare, Queen Mary University of London is hosting a photographic installation by Brazilian artist Ellie Kurttz, one of the UK’s leading theatre photographers. Commissioned by the Royal Shakespeare Company and Shakespeare’s Globe to photograph their productions over the last decade, Ellie Kurttz reveals an invaluable perspective on the making of Shakespeare as our global contemporary. The eleven large-scale images adorn the People’s Palace Foyer from the 17th to the 28th of November and were part of Ellie’s first solo show in Brazil in April and May 2014, which was seen by over 18,000 people. The exhibition ‘Shakespeare by Ellie Kurttz’ was displayed in four major cultural centres in the cities of Rio de Janeiro, São Paulo, Brasília and Belo Horizonte during 2014 as part of Shakespeare Forum, a programme of artistic and educational workshops, seminars and masterclasses with international theatremakers and academics produced by People’s Palace Projects (a research centre based in the Drama Department at QMUL) in celebration of Shakespeare’s 450th anniversary. The exhibition, designed and curated by Brazilian artist Gringo Cardia, was seen by over 18,000 people during the course of its five week tour. Her first book, ‘Shakespeare’ by Ellie Kurtzz, was also launched as part of the project. Originally from Brazil, Ellie graduated with distinction from Central Saint Martins School of Art and Design in 2002 and since then has had a highly successful career as a freelance photographer. In 2002 Ellie was commissioned by the RSC (Royal Shakespeare Company) to create an exhibition that reread the Jacobean Play ‘Westward Ho’ through photography. The exhibition opened at the Swan Theatre, Stratford upon Avon, in summer 2002. In 2006-2007 she was the resident RSC photographer documenting the entire ‘Complete Works’ Festival.The photos later became an exhibition of 600 images displayed in various forms throughout the Royal Shakespeare Company’s theatres. She was the Royal Shakespeare Company Artist in Residence from 2008-2009. In 2011, the Royal Mail launched a series of 10 stamps commemorating the Royal Shakespeare Company’s 50th anniversary; 4 of the stamps feature Ellie’s images. In 2012 she was commissioned by Shakespeare’s Globe to document the ‘Globe to Globe’ Festival, part of the London 2012 (Cultural Olympiad). In the same year, her photographs commissioned for Rio Occupation London (a project that brought 30 Brazilian artists to London for a month long residency) were seen on the front page of Rio’s Globo newspaper. As a former ballerina, Ellie Kurttz has a great connection to movement, and her performing arts images are dynamic, with great aesthetic beauty. Her images have appeared in publications such as The New York Times Magazine, Vogue, The Guardian, The Independent and Time Out amongst others.